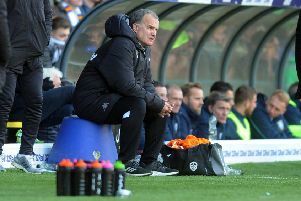 Leeds United are still without a home win this season, but came from behind at the break to earn a 1-1 draw with Brentford in a strange game at Elland Road. In a surprisingly flat first half in front of a crowd of 25,126 the Whites looked far too sluggish and hardly threatened the Brentford goal, but the second half was totally different as head coach Uwe Rosler changed tactics and his team were ultimately a little unlucky not to take all three points. Mirco Antenucci came off the bench to score Leeds’ equaliser with another terrific finish and had a great chance to win it late on while Chris Wood saw a deflected shot come back off the post and should have won a penalty when his shirt was virtually pulled off his back in a challenge in the box. But it was a poor first 45 minutes from Leeds as they tried to knock the ball about, but looked strangely off the pace. Brentford had a chance in the second minute when Konstantin Kerschbaumer saw his close range effort well cleared by Gaetano Berardi. At the other end Charlie Taylor got a shot in from 25 yards that was parried by visitors’ keeper David Button before the game settled into a lethargic affair. Stuart Dallas chipped a shot over from the edge of the box before Alan Judge went close for Brentford and they went ahead on 29 minutes. United were caught stretched to a break and Judge went round covering defender Sol Bamba before passing onto striker Marco Djuricin who went round Liam Cooper to fire confidently past keeper Marco Silvestri. The rest of the half largely went by without incident and the home players walked off to a few boos from the crowd. The second half was a much more exciting affair, however, as Leeds went 4-4-2 with striker Antenucci on for the ineffective midfielder Alex Mowatt and put more spark into their play. They had a let-off as Silvestri lost a cross and Jake Bidwell’s header went across the box before being cleared by Chris Wood. But the pressure began to mount on Brentford with Button down to save a low Dallas cross then Wood being denied the clearest of penalties when his shirt was pulled as he tried to get his head to another cross. Byram shot over from the edge of the box following a good run by Lewis Cook, but Brentford should have made it two just after the hour as Silvestri gave the ball away with a poor pass out and could only watch as Djuricin hit the post with a shot when unmarked in the box. Three minutes later it was United’s turn to be denied by the woodwork as Wood’s deflected shot hit the post from a low right wing cross with Button beaten. Wood then headed another chance over from a Byram cross and second sub Luke Murphy fired wide from 25 yards out while the visitors still had some threat on the bench as Kerschbaumer sent a weak header wide and Lasse Vibe was only just over with a shot from the edge of the box. Leeds kept going, however, and were rewarded on 76 minutes when Dallas forced Ryan Woods into giving the ball away and Wood found Antenucci, who beat Button with a fine shot from the edge of the box. The Whites went for the winner and Byram hit a powerful shot not far wide before Charlie Taylor could not get enough power behind his header after a corner was not cleared and Button was able to save easily. In a thrilling finish Vibe was not far wide with a shot from the edge of the box for the visitors then Murphy shot over when a pass would have been a better option. In injury-time one last chance fell for Leeds when Antenucci raced through only to go a little wide and see his shot saved by Button. Head coach Rosler thought his side deserved to get something from the game after picking up from a poor first half. He said: “The first 15 minutes we started well, but Brentford are a good side and know they what they were doing. “They had a chance, we made a mistake and we lost our confidence too quick, they scored and we looked a little afraid to get on the ball. We went a bit too passive. “The second half the substitutions helped us and in the last 25-30 minutes we battered them in football terms. “We changed the game, got the equaliser deservedly and went for the kill. We were disappointed not to get the winner. Leeds: Silvestri, Berardi, Bamba, Cooper, Taylor, Byram, Cook Adeyemi (Murphy 57), Mowatt (Antenucci 45), Dallas, Wood. Brentford: Button, Colin (Woods 74), Dean, Tarkowski, Bidwell, Vibe, Diagouraga, Kerschbaumer, McCormack, Judge, Djuricin (Hofmann 63).